Leg spinner Imran Tahir enjoyed a memorable one-day international debut for South Africa, claiming four wickets to restrict West Indies to 222 all out in a World Cup Group B match on Thursday. Chasing 223 for victory, South Africa overhauled the target for the loss of three wickets, with 43 balls to spare, after AB de Villiers hit a fine century. Earlier, South Africa went into the match with all three frontline spinners and after winning the toss, skipper Graeme Smith wasted precious little time in unleashing one of them, Johan Botha, in a move that is getting increasingly popular in the tournament. Darren Bravo's assured half-century and his half-brother Dwayne's quickfire 40 raised West Indies' hopes of a bigger total but they ended up setting South Africa a modest target after losing their last five wickets for just 13 runs. 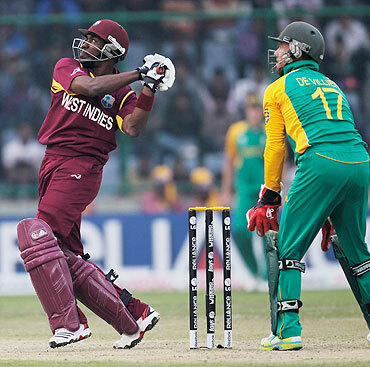 West Indies lost opener Chris Gayle in the third delivery of the day but Darren Bravo's (73) third ODI half-century and the 111-run partnership he forged with Devon Smith (36) helped the twice champions to put behind their wobbly start. Opening the bowling, the off-spinner induced an edge from danger man Gayle's tentative blade with his third delivery that flew to Jacques Kallis in the lone slip. Darren Bravo and Devon Smith denied them another chance to celebrate until the 24th over. Botha's new ball partner Dale Steyn could not make much of an impact in his first three overs before paving way for Kallis who appeared to have fully recovered from a side strain to resume bowling duties. Darren Bravo welcomed the South African all-rounder with a couple of boundaries in his first over and went on to hit six more to go with the six off Tahir before Botha trapped him lbw. From 113-1, West Indies suddenly slumped to 120-4 with Tahir claiming Ramnaresh Sarwan and Devon Smith. 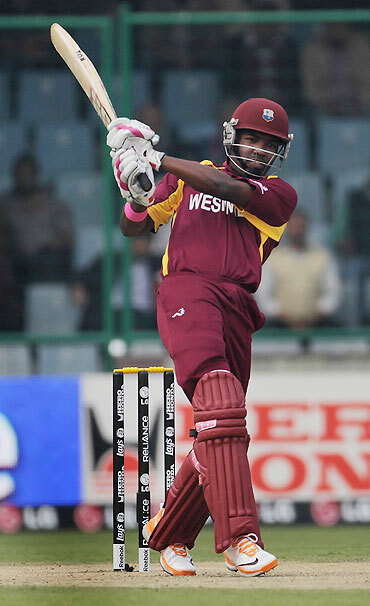 Dwayne Bravo took the onus on himself to score at a brisk rate, hitting three sixes in his enterprising 37-ball knock that came to an end after an almighty mix-up with Shivnarine Chanderpaul (31). Chasing a paltry 222 for victory, South Africa got off to a good start with opener Hasim Amla in full flow (14 off 15). He slammed two crisp boundaries to set the ball rolling for the Proteas. But at the other end, his opening partner, Graeme Smith was slow off the blocks. He was struggling to middle the ball and had a close shave as he averted a run-out. But West Indies checked the flow of runs, when Keemar Roach had the dangerous Amla caught behind by 'keeper Devon Thomas in the 4th over. Two overs later, it was Jacques Kallis's turn to return to the pavilion as he was dismissed by left arm spinner Suleiman Benn. Then AB De Villiers joined his captain at the crease and both batsmen played steadily to avert any further problems. They stitched up a solid partnership of 119 runs before Keiron Pollard bowled Smith for 45 off 78. His score was inclusive of 2 boundaries. 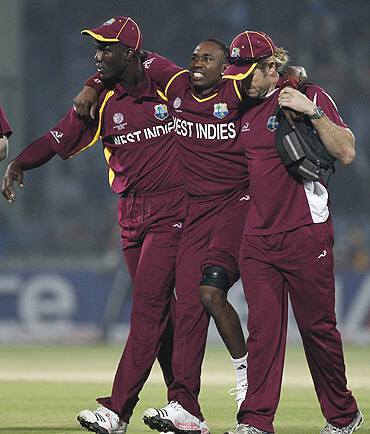 West Indies received a huge blow when all-rounder Dwayne Bravo suffered a knee injury when he fell over while bowling the 14th over. Having scored 40 brisk runs with the bat, Bravo was sending down the first ball of his third over when he slipped on the follow through. Bravo was seen lying on the pitch clutching his knee before he hobbled off the ground with his arms around the shoulders of two team mates. "Looks like he has hurt his left knee," a team spokesman said. "He will take no more part in today's match. He will undergo a scan tomorrow and at that point, I'll be better able to tell you how the injury is." Kieron Pollard completed the over. For South Africa, De Villiers continued to shine with the bat as he played a composed innings before rains stopped play. South Africa were 199 for 3 from 38 overs before rain stopped play with De Villiers on 97 and Jean Paul Duminy batting on 28. De Villiers went on to complete his century (off 97 balls) in the first over, bowled by Benn, when play resumed after the brief rain break. 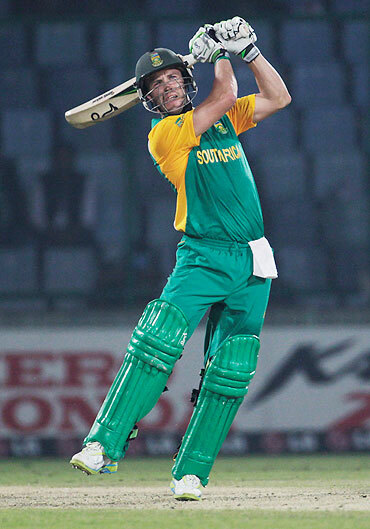 De Villiers drove the ball through the covers to register the fastest century by a South African in World Cups. The century man had JP Duminy for company till the end and both batsmen helped South Africa cross the finish line with ease. De Villiers came out attacking right from the start as he stroked 107 not out from 105 balls, hitting eight fours and two sixes. At the other end, JP Duminy finished unbeaten on 42 from 53 balls, with the duo involved in an unbroken stand of 84 runs in 86 balls.